DETROIT, MI – Jan. 15, 2019 Today – at the 2019 North American International Auto Show – Bosch and Mojio debuted an integrated connected mobility solution for OEMs. 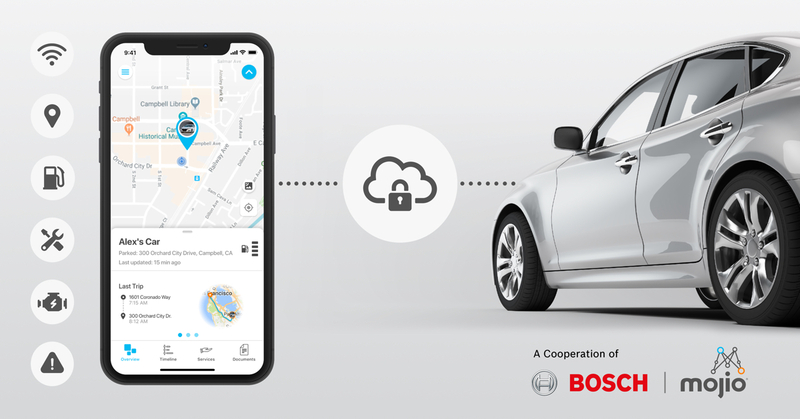 This new offering integrates Bosch’s connectivity control unit (CCU) with Mojio’s Telco-grade cloud platform, unlocking the ability for OEMs to launch and scale cost-effective connected services, while enabling the delivery of user experiences that enhance vehicle safety, reliability and convenience for their customers. Increasing expectations from consumers can be at odds with the defined production cycles and high costs of digital transformation required to design, deploy and scale connected mobility solutions. Mojio’s agile approach to connected mobility has been a game-changer for speed-to-market and consumer satisfaction, delivering affordable, highly-reviewed connected car services to nearly a million drivers in North America and Europe through the company’s nine Mobile Network Operator customers, including Deutsche Telekom and T-Mobile. Together, Bosch and Mojio now provide OEMs and mobility providers with the flexibility to select the necessary cloud software components to enhance existing connected services, or the ability to leverage an end-to-end solution that accelerates speed-to-market, improves scalability and delivers on consumer expectations. Bosch and Mojio will present the integrated connected mobility solution from Bosch and Mojio during NAIAS press and industry days, January 14 – 17, 2019, at the Bosch booth located in room 330A on the 3rd floor concourse of the Cobo Center.